Is it just me, or does anyone else attract other people’s cats like a magnet? I recall a day trip to Canterbury with my other half, many years ago. We hadn’t been together long, but he had already twigged that I could find a cat in the most unlikely places. Having just left his vehicle in an underground car park, we were looking for the way out. He spotted a sign and took my hand, but it was already too late. I had seen a cat heading in our direction and we spent the next ten minutes giving him a fuss. I once found a cat in the famous Highgate cemetery. He must have gone there to hunt in the undergrowth and he clearly wasn’t best pleased when I turned up with my rucksack and camera. He slunk away behind the headstones before I could take a portrait. I was up in the Lake District last autumn and had parked up by a farm to make the long walk down to Buttermere where I was hoping to catch the early morning mist over the lake. I found the mist, but that wasn’t all. There in the middle of nowhere was a very friendly black and white cat. I had struck lucky once again! The image featured above was taken of the neighbour’s cat at the B&B in Keswick. Her owners were away for a few days and she would greet me every morning as I set out with my camera equipment before dawn. Other times she could be found waiting outside the local supermarket. Her name is Poppy and she is fifteen years old. The photograph below was taken while I was on a ten-mile circular walk a few years ago. I call him the Laundry Cottage cat. This entry was posted in Zooey and tagged cat, cats, cute, katze, katzen, kawaii, ねこ, ﾈｺ, 猫. Black and white photos capture so many more subtle nuances. This is just gorgeous. Yes to attracting other people’s cat and dogs too, good to know I am not alone in this. i run into cats everywhere. 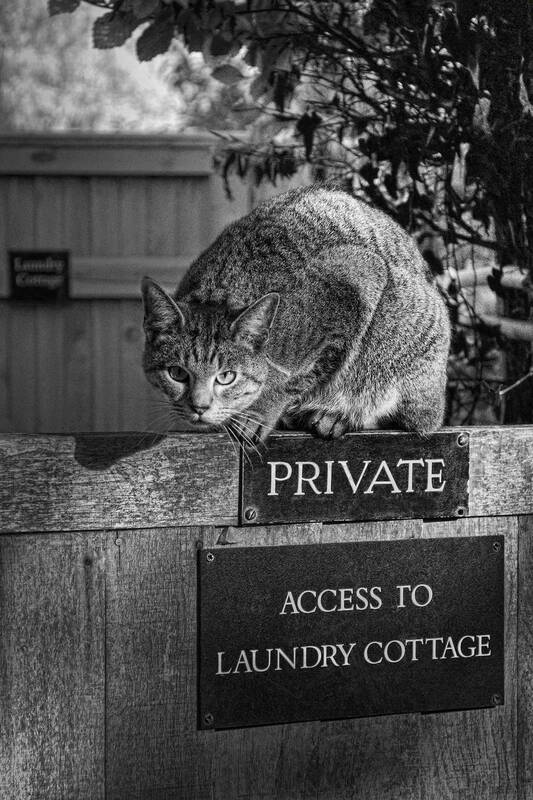 though i live in a city, i can’t step out without seeing butterflies, squirrels, dogs, a variety of birds, living frogs, squashed frogs…by the way, that’s a gorgeous pic..love the private sign and the cat’s expression! Beautiful pic, Keswick is lovely too. Lol yes, I seem to attract a lot of cats…perhaps I should stop carrying treats in my bag! You never know when you might meet a cat in need of a Webbox stick, or Dreamies nugget..lol! May I add my two, three stories of strangers’ cats? I once walked past abandoned barracks in Nienburg (North Germany), and right there, sunning in the late summer sun was a young cat, maybe 4 to 5 months old. It came up to me and purred and let me caress it. I just had to leave it after a while as I had to walk to the train home. In 2000 I was visiting Brighton and the last day of language school had passed and I went down and out of the building and there was a fluffy cat, saying hello, obv. belonging to the house I stood in front of. This cat was gentle and came up and let me stroke it. Visiting an acquaintance in New York I went with her to a friend of hers. They had 3 cats – and the shyest one came to me and stayed with me for that short visit. And here, in my neighbourhood, I came across a cat running between some appartment houses, she belonged to someone, but was very eager to let me near her. I suppose she wanted me to help with the two tics I saw on her face! Could not help, of course. Not without a tool. So yes, some of us are cat magnets. My husband once said I could spot a cat on Mars with the naked eye. Not quite but almost. When I was catless (those sad years) I would go on kitty walks and they would come out onto the sidewalk to greet me. Now that I have cats, not as much. God, I love ’em! You just have the magic touch! Or maybe you smell like catnip! It seems that my address is well known among the homeless cats. They just show up in my garden. I have rescued a number of felines over the years and have been given so much joy. I have 4 of these gorgeous friends at the moment and feel very blessed. I have “Milk bone Underwear” and attract dogs like you do cats. I even carry bones, water and a leash in my car now as it could be anytime I see a dog running around! I think cats just know who to be drawn to. I’ve been sitting in a lounge room while my mother had a reading with a clairvoyant and her cat came and found me. Curled up and went to sleep on my lap branding me with all her fur……..special cat obviously. what an excellent picture of the kitty. tells a story . . .
🙂 My barn cat became my barn cat, just that way. Animals of all kinds are attracted to me and it is quite the adventure. Wouldn’t have it any other way. I love the photo, the cat seems to be saying “See here, can’t you read?”. Your post reminded me of a trip I made with my sister-in-law to a farm which grew herbs and plants for dried arrangements. Wile she was in the shop I waited on the porch. She came out to see a basket of kittens climbing out to stumble all over my feet, purring madly. We next went to the drying barn, she walking ahead of me. When she turned around to ask me a question she said it looked like cats were coming from everywhere toward me, she counted at least seven or eight. Finally as went went to the car, a very battered old tom followed and tried climbing in to the seat with me at which point she “What are you wearing, cat pheromone?”.